It's that time of year again, when our social media feeds will be spammed with endless pictures of chocolates, candle-lit dinners, cute gifts and engagement rings; it's Valentine's Day or as some like to call it Single's Awareness Day. It's that glorious day that reminds us single girls just how single we really are and I'm not gonna lie it gets depressing. I'm going to be totally honest, I've celebrated every Valentine's Day alone. Yup this girl has been single for 20 whole years. I know that's incredibly embarrassing and I actually started blushing and cringing as I typed it out but it's true. 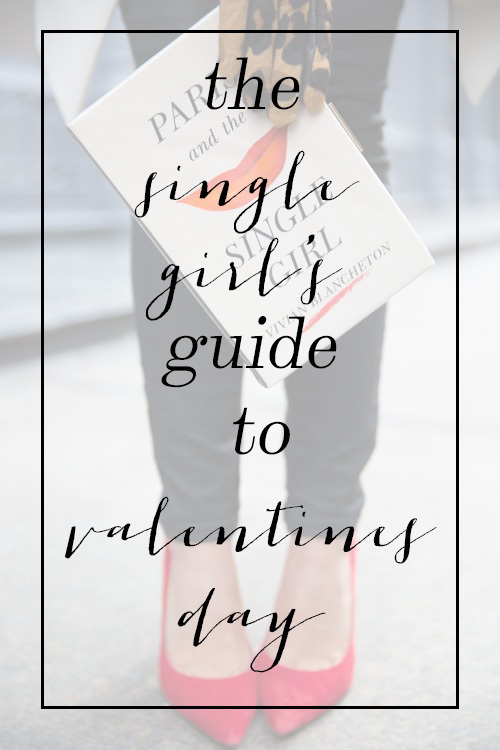 Whether or not this is your first time celebrating alone or you're carrying on the tradition like me I'm going to be sharing how the single girl can survive Valentine's Day! No. 1: Don't feels sorry for yourself// That is the worst thing you can do. Don't loathe away in your bed stuffing your face with ice cream and watching Nicholas Sparks movies. I know it sounds tempting but it will only make things worse. No. 2: Remember all the people who love you// Just because one person doesn't appreciate you does not mean you are not loved. Take a few minutes and think or write down a list of the people who love you. Your parents, siblings, family, friends, co-workers, classmates, sorority sisters, teammates, etc. There are plenty of people who love you out in the world. YOU ARE LOVED. Remember that. No. 3: Be patient// This is the hardest thing to do, trust me I'm the most impatient person ever. But it's all in the timing. Your Prince Charming will come along one day and sweep you off of your feet, you just have to wait. "If you were happy with the wrong one, just think of how happy you'll be when the right one comes." Okay now that we've established the 'ground rules' it's time to grab your best girl friends and have a little fun! No. 3: Girl's Night Out// Grab your girls, your killer dress and heels and go out! Whether it's dancing, clubbing, bar hopping, dinner, etc., get out of the house and go have some fun! Just remember not to do anything too reckless or that you will regret. Have fun responsibly! No. 5: Treat Yo Self// This means any number of things. Splurging on a new handbag or shoes, going to get your nails done, getting a massage, etc., etc. Pamper yourself, go all out. You deserve it girl. I know I sure am! If that doesn't work then I mean you do always have romantic movies, ice cream, chocolates and wine to turn too..... But I highly suggest trying the other thing first. They're more fun. If you're still not feeling up to it read this Buzzfeed article, complete with appropriate gifs. The key thing to remember is that it's just a day. And if you don't have someone special or something romantic planned it's not the end of the world. Make the day about you or celebrating it with your friends and having fun. Don't stress about it, enjoy not having to spend tons of money on your partner, instead spend it on you! How are you spending Valentine's Day? Love it or loathe it? If you're single do you have any tips on how to survive the mushiest day of the year? Leave a comment sharing your thoughts! "just remember that being alone on valentine's day is no different than any other day of the year"